I have learnt that in cricket each season and each innings is a new lesson. This has been one more such season, where we have learnt that talent alone does not win matches or competitions. Everyone needs luck but also all players must apply themselves to the task consistently. The current season, which has just come to an end, was a disappointment for the Daredevils, me personally and the players. We know that we have not lived to the expectations of our fans and supporters in Delhi. 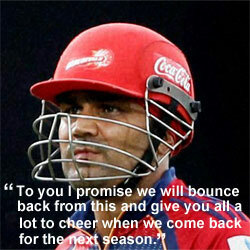 I have now spent four years with the Delhi Daredevils, a team that is as dear to me as the Indian national team. For the last four years the fans have supported us by coming out in large numbers. The fans are justified in feeling let down. Inside the team it hurts us as much as it hurts you, our fans, for not being able to produce a result that we should have. We had a team with great potential but we did not play to it. The net result: we failed to qualify for the play-offs. Frankly, when we lost a few early games, I always felt that we could bounce back and turn the momentum around. But it just did not happen. We came close on many occasions, but again the wins eluded us. In a tournament that is long with 14 league games each, form and fortunes can change more than a few times, as it has happened with a quite a few teams out there. A winning streak can suddenly disappear, just as a losing streak can be turned around. We have a young team that has a lot of ability and I am confident that we will come out of this disappointment and perform in a manner that will bring joy to the city of Delhi . To you I promise we will bounce back from this and give you all a lot to cheer when we come back for the next season. Thanks once again for your unstinted support.